Today we take on a centuries-old and very popular meditative fitness form, Yoga, against the young upstart, Tai Chi. FIGHT! Wait, no, there’s no fighting allowed in Tai Chi. Or is there? I wanted to dive into this topic because Yoga is very popular right now and I wanted to capitalize on all those keywords out there and turn this blog into total clickbait. Seriously though I’ve seen a few things recently that got me thinking about this topic. Ryan suffers from chronic pain because he was in a severe helicopter crash when he was in the Marines in Afghanistan. Much of his lower spine needed to be reconstructed and with his recent transition from desk analyst to field operative, he’s gotten in some tussles that are causing him pain. Like I’ve said before, I’m all about “you do you” and Yoga can definitely be incredibly beneficial to people. However, I think a case like this Tai Chi is a better suggestion. I know, you’re shocked “Tai Chi Guy” thinks he should do Tai Chi instead! If you already practice Yoga I think Tai Chi is a great practice to add to your routine to give you some variety. As long as what you’re doing in Yoga is safe I’m totally cool with it. However, I’ve seen a lot of bad, poorly taught, and potentially hazardous Yoga. I highly recommend you spend some time to find a good instructor and verify his/her training and certifications to make sure your instructor knows what he/she is doing. The same goes for Tai Chi instructors! One thing you should be very careful of is trying to learn a fitness practice like Yoga or Tai Chi strictly online. While I think video instruction can definitely help people who may not have the opportunity for in-person instruction, there’s a lot of bad Yoga and Tai Chi out there on video too. Spending time with an instructor gives you the personal attention you need and I feel helps enhance you’re learning experience. Your instructor will probably also be able to suggest videos you can use to enhance your practice. With a good instructor, I think you can benefit whether you choose to practice Yoga, or Tai Chi, or both. So let’s get on to the comparison! FIGHT! I believe there are really three primary similarities between Yoga and Tai Chi. 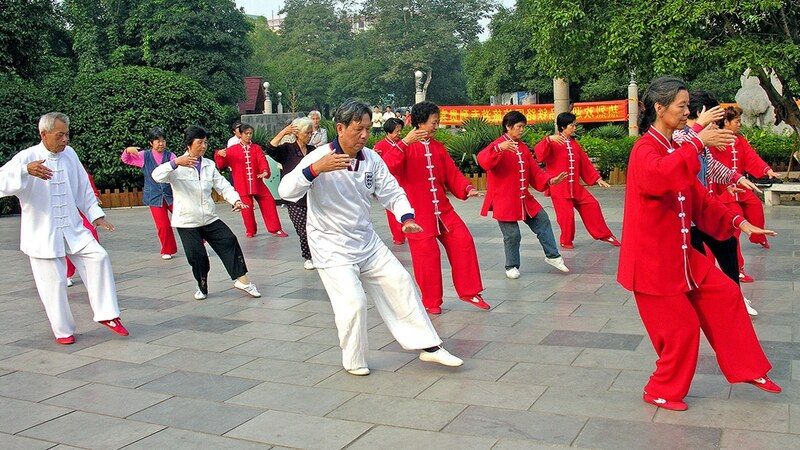 Tai Chi originated in China and is not as old as Yoga is. There are many Taoist (DOW-ist) principles at the core of Tai Chi. For instance, the concept of opposing forces of energy or Yin and Yang is a foundational Taoist principle that is at the core of Tai Chi as well. Tai Chi is really an evolution of other neijia (NAY-gee-ah) or internal martial arts such as Qigong (CHEE-gong) and Baguazhang (BAH-gwah-zhi-han). All of these practices are rooted in the religions of Taoism, Buddhism, and Neo-Confucianism. Tai Chi is the child of these other neijia martial arts and, as such, is likely only a few hundred years old. Yoga, on the other hand, is believed to be more than a thousand years old, if not older. It is derived from Hindu traditions and appears in many Hindu texts. So here we have our first similarity of both Yoga and Tai Chi in that they both originate from eastern religions with a particular focus on meditation. Both believe that enlightenment and liberation can come from the meditative practices of their forms. Building from the meditative aspects of both is the importance of breathing in both Yoga and Tai Chi. In Tai Chi this breathing is commonly referred to as Dantian (don-TEE-en) breathing. In traditional Chinese medicine, the Dantian is considered the center of Qi (CHEE), or energy, in the body where energy is both stored and generated from. Using the Dantian breathing method one imagines that the breath is coming in through Dantian as it expands in the body. The Dantian concept is similar to the concept of Chakras used in Yoga. However, there are some slight differences and the focus on breathing in Yoga is that breath itself is Prana, or energy very similar to the concept of Qi. Even if you don’t believe in these traditional Chinese or Indian medicine beliefs you shouldn’t let it affect your perception of Tai Chi or Yoga. In the case of Tai Chi this Dantian breathing is just deep diaphragmatic breathing that has proven medical benefits. Psychology Today wrote about the science of slow deep breathing and both the New York Times and Wall Street Journal have written about the medical research into its benefits. With the deep breathing, the lower organs drop in the body allowing the lungs to further expand. When the practitioner focuses on inhaling from the diaphragm and then exhaling in a controlled manner it works these core muscles and builds breath control which can have enormous benefit. This controlled breathing is a cornerstone of both Yoga and Tai Chi and brings the health and mental benefits to the practitioners of both. Our last key similarity is that both Yoga and Tai Chi are based on slow, controlled movements. While there are some significant differences in the movements of Yoga and Tai Chi which we’ll cover in a moment, they are both rooted in this concept of control that comes from moving slowly. This philosophy leads to the graceful appearance of Yoga and Tai Chi that comes from the practice of moving slowly and in a controlled manner. In Tai Chi there are some forms that have quicker movements such as Chen-style in particular which is the oldest and most martial form of Tai Chi. However, for the most part, Tai Chi and Yoga are both races to see who will finish last as opposed to who will finish first! Earlier I discussed how important meditation is to both Yoga and Tai Chi. Where they depart though has to do with movement. Yoga is mainly concentrated on its poses or positions and movement is confined to the transition between the positions and internal focus while maintaining a position. The nature and meaning of these positions are rooted in Hindu beliefs. By contrast, in Tai Chi, we are striving for a state of continual motion. While we may have checkpoints in our forms the pauses should be imperceptible to most people. 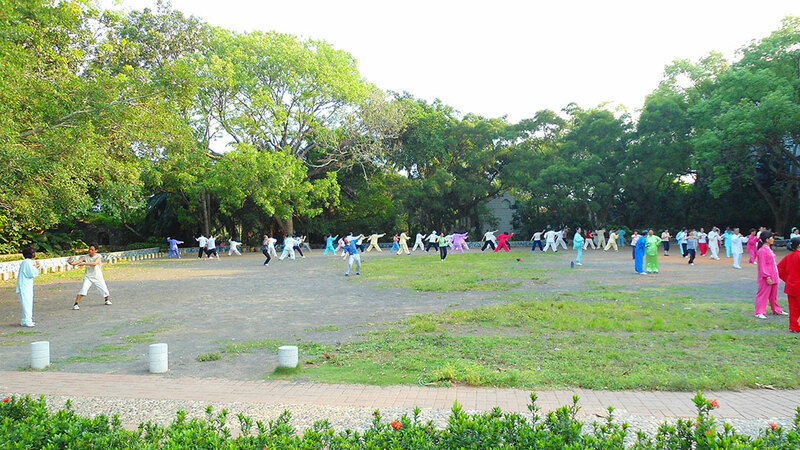 In many ways, Tai Chi is similar to coordinated dance movements. I believe this focus on movement as opposed to maintaining a position is one of the main benefits of Tai Chi not fully realized in Yoga. In fact, movement has proven therapeutic value. For many with chronic conditions, the pain leads the person to cease movement which only exacerbates the conditions they suffer from. Tai Chi introduces movement in a way that keeps people in tune with their body. Medical research has demonstrated how important movement is for recovery in patients. I had a major internal surgery a few years ago where I was encouraged and motivated to get up and walk around the day of the surgery, a practice advocated by the University of Wisconsin Health System. This is in stark contrast to older medical practice where patients were kept in bed based on the belief the patient needs to rest in order to conserve energy and recover. As UW Health found, this can lead to blood clots and lung problems which can not even hinder recovery but can be fatal as well. The American Journal of Nursing has published similar guidelines on how movement (ambulation) can help avoid complications after surgery. None of this is to say the practices in Yoga are dangerous, only that they lack some of the benefits that movement reaps as found in Tai Chi. One area where Yoga and Tai Chi are pretty much polar opposites of each other is the way each approaches the limits of our bodies. 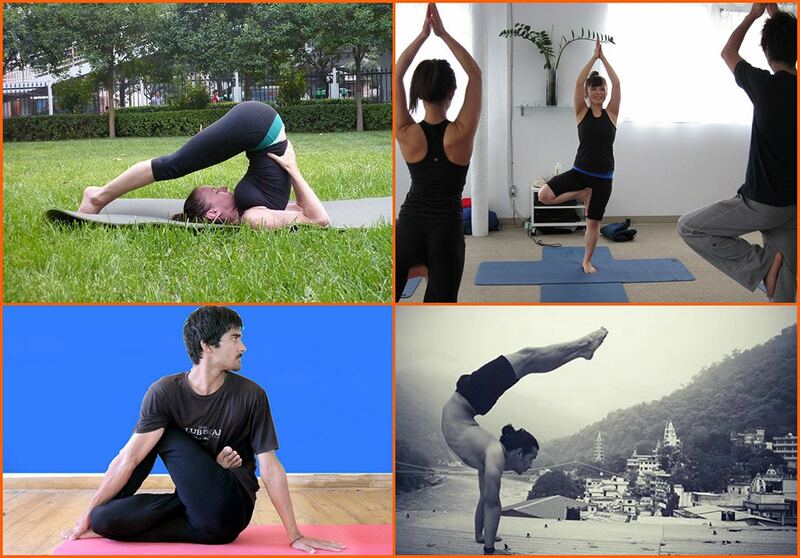 In Yoga, there are many positions and poses that are designed to get the body to be in a certain orientation. I think I can speak for just about anyone who has tried Yoga that many of these poses are not natural and some, if done the wrong way, can be painful and result in injury. Some Yoga instructors have recognized this and teach modified and even seated forms. However, this practice seems to be the exception on not the rule. Whereas in Tai Chi, our practice is focused on staying within our body’s limits and the forms and styles that push these limits are the exceptions rather than the rule. I think the basis for this practice is in Tai Chi’s origin as a martial art. In most martial arts there are foundational principles designed to avoid injury. A good example of one of these principles is not allowing the knee to extend beyond the toe. This extension is dangerous and can cause damage to the knee. Tai Chi is focused on staying in tune with your body and recognizing where our limits are. Yoga and much of western exercise try to push past these limits with more exertion or something I frequently call the “longer, faster, strong, harder” philosophy. Tai Chi is much more introspective in that the practitioner is encouraged to get in touch with his or her own body and discover where the boundaries are for that individual. It’s the understanding of those boundaries that allows for the practitioner to gradually build and extend them. Put simply, it’s about not forcing our body to do something it doesn’t want to do. My final difference, on one of my main reasons for my preference for Tai Chi is a practical one: Tai Chi’s foundation is as a martial art. This is a huge difference between the foundation of Yoga. At the end of the day, every movement in Tai Chi has a practical application in martial arts that were developed in China. As we discussed earlier, Tai Chi is a product of other neijia (internal) martial arts in contrast to what we would commonly call kung fu. However, even though it is an internal martial art every movement has a martial application. Even a simple movement like “cloud hands” that exists in every form of Tai Chi is based on warding off a punch and deflecting a kick. Even the most beautiful and graceful of movements found across the various Tai Chi styles have self-defense at their core. 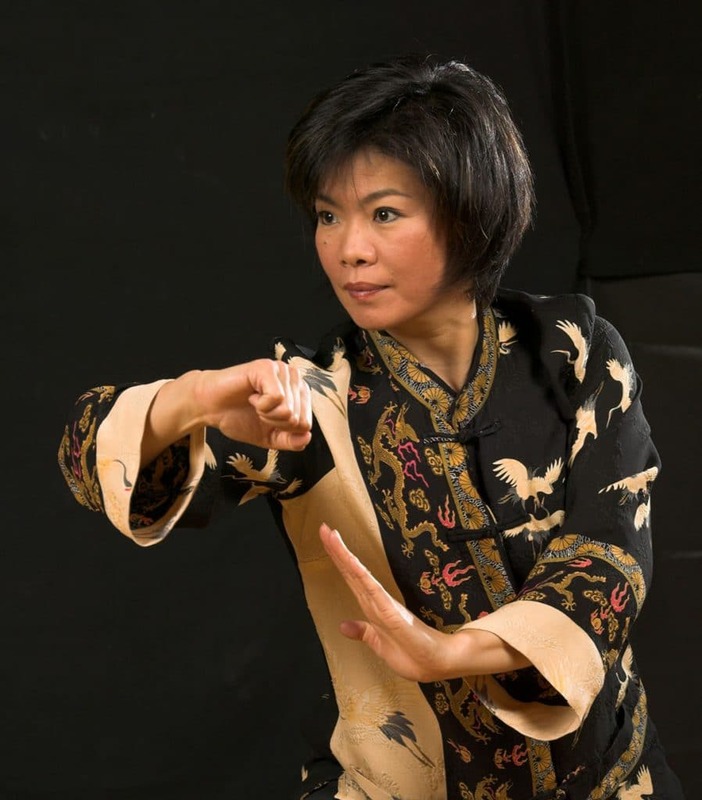 Tai Chi can be used as a self-defense method and many Tai Chi players use a practice called “push hands” which has to do with detecting an opponents imbalances. While it’s not something I teach in my classes the value and practicality are still there. In contrast, when you look at Yoga, I’m not sure if you’ll find a practical application to the majority of positions there. 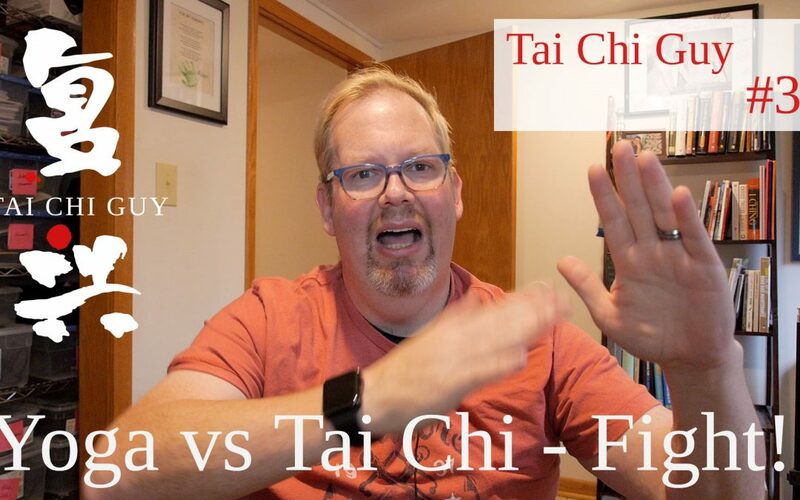 While I’ve had tried to have some fun with this concept of a battle between Yoga and Tai Chi I hope you have found I’ve tried to be fair to both while sharing what I love about Tai Chi. “You do you” is an important philosophy to me so if you have found your connection with Yoga I would never discourage you from it as long as you’re getting good instruction and being safe. Maybe this article has encouraged you to get a better handle on that. If you add Tai Chi to your Yoga I think you’ll only gain additional benefits the variety will bring to you. I think Tai Chi can likely help you find some balance and focus to your Yoga. In fact, I’ve found many times that practicing one style of Tai Chi brings concepts that help improve my other styles and my enjoyment. What do you think? I’d love to hear from you and get a discussion around it. I look forward to hearing from you!